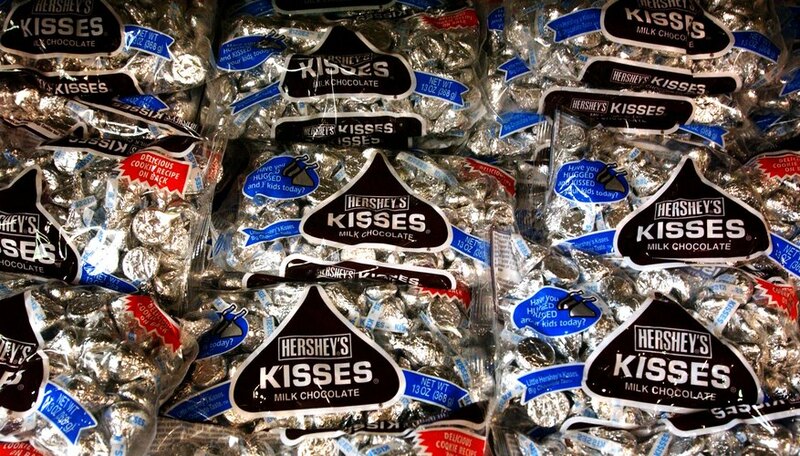 You don’t need chocolate lips to give an extra sweet kiss when you have Hershey’s Kisses. These tin foil-covered chocolate morsels can be customized by attaching a homemade label to the bottom of each Kiss. You can create your own unique Hershey’s Kiss label or use one of the many templates available for this project. Print the desired Hershey's Kiss label template on card stock. Hershey's Kiss label templates on available for free from various online resources including the official Hershey's website. Cut out all the circle labels with the hole punch. Turn the hole punch upside down when punching the labels out. This will allow you to see where you're punching so you can make sure the labels are centered and aligned correctly. Rub the back of the cut-out circle label with a glue stick and immediately press it against the bottom of the Hershey's Kiss. Continue in this manner until all the Kisses have the customized labels. Lay a sheet of 3/4-inch adhesive stickers/labels on a flat surface. Create your desired design on each round sticker. You can use stamps and markers to make your one-of-a-kind designs. For example, monograms of a happy couple getting married are ideal for engagement parties. Let the design dry for a few minutes. Peel the label off the paper carefully and attach it to the bottom of the Hershey’s Kiss. You can also make customized labels by loading a Hershey’s Kisses label template in an editing software, editing the label to fit your desires and then printing the template on 3/4-inch adhesive labels/stickers. Fill jars or bags with the customized Hershey’s Kisses. You can also sprinkle the Kisses around tables for a fun and edible decoration.